Marine 31 Mildew Remover 128 oz. Remove stubborn mildew stains � FAST! 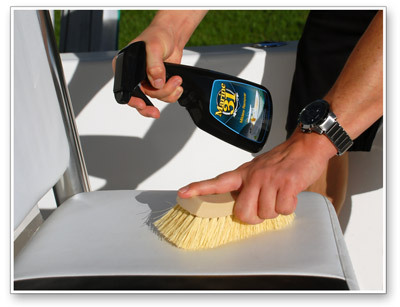 Marine 31 Mildew Remover quickly and safely removes stubborn mildew stains on virtually all marine surfaces, including vinyl seat cushions, rubber fenders, fiberglass, gel coat, canopies, and more! Marine 31 Mildew Remover forgoes volatile cleaners and instead relies on smart chemistry; even severe mildew growth is no match for the incredible cleaning power of Marine 31 Mildew Remover. 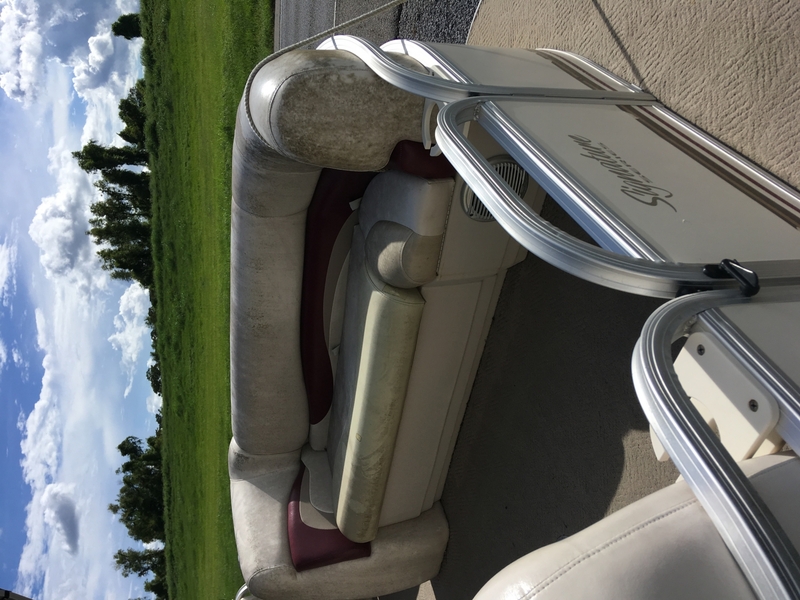 If you�re a boater, chances are you�ve dealt with stubborn mildew stains on vinyl cushions. If you�re reading this product description, chances are you�ve been less than satisfied with the performance of other so-called marine mildew cleaners. Fortunately for you, we�ve compared Marine 31 Mildew Remover against other marine mildew cleaners and have found that it removes mildew stains faster, with less effort. Not all marine mildew removes are created equal! Most over-the-counter marine mildew cleaners rely on heavy concentrations of bleach and other volatile chemicals that actually cause more harm than good. Marine 31 Mildew Remover removes stubborn mildew stains without discoloring, dulling, or drying out vinyl surfaces. Best of all, it still retains the powerful cleaning ability to remove mildew stains � FAST! Marine 31 Mildew Remover works wonders for household cleaning as well! Use this professional strength formula to clean tile, grout, showers, bathtubs, counters, and sinks. Spray directly onto surface and allow 1-3 minutes for penetration. If necessary, agitate surface with a brush or terrycloth towel. For stubborn stains, allow cleaner to penetrate for 5 minutes before agitating. Thoroughly rinse and dry surface. 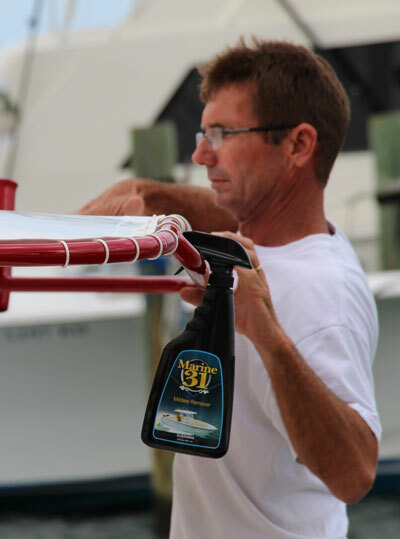 Follow with Marine 31 Mildew Guard to protect treated surfaces. This product is by far the best to use on boat seats I've ever seen or used. Looked horrible before, like new after use. Simple answer, just give it a try and you'll never buy anything else again. see photos! I have to admit that I was skeptical when I ordered this but it really did a great job on the mildew that had developed on our pontoon at the end of this rainy summer in Central Pennsylvania. I honestly wish we would have taken before and after pics. We will definitely be buying Marine 31 again. Works as advertised. What took me 4 1/2 hours last year with 3 people cleaning this year took 2 hours with 1 person cleaning. I have already recomended it to everyone I know that has a boat. Rarely have I used a product that works so well. I have tried every other products combination and elbow grease with no results. 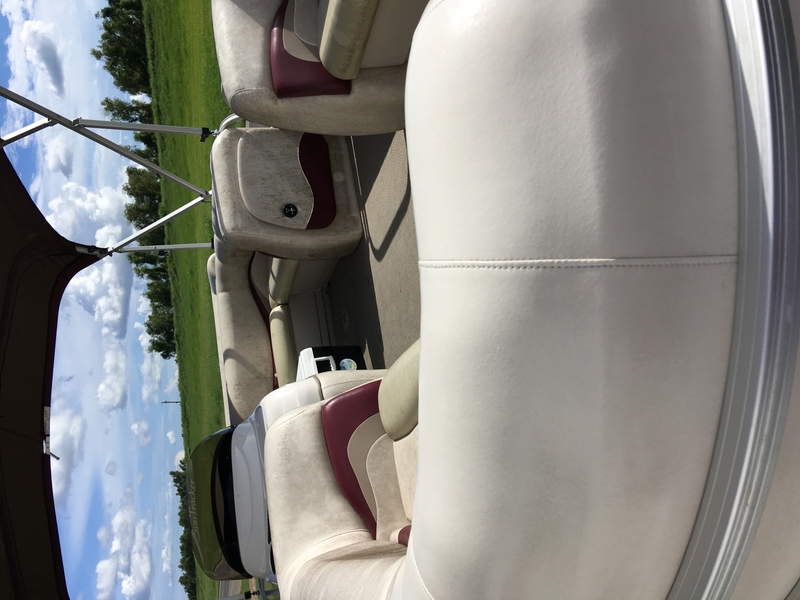 Marine 31 worked on my vinyl seats on my pontoon that looked awful with black mildew stains, they disappeared within seconds of applying the product and then looked brand new! Very satisfied with the results. Best Mildew remover on the market. Spray, wait and the mildew vanishes. It�€™s like magic. For stubborn areas, use the horse hair brush. Not exactly as strong as the YouTube video made out to be. Seat they sprayed it on was 3 times in worst condition than mine and came clean but I get it and it�€™s no stronger than normal everyday cleaning solutions. Little disappointed but knew that what they say and what is is two different things. Really works on stubborn mildew. Absolutely love this product. Our boat seats are new again. We had tried everything but nothing worked. I googled to see if there was something that we hadn't tried and found a video of Marine 31. I ordered a bottle to see what it would do and we were amazed. Love! Love! Love this product. Best mildew remover I've ever used. Got it for my boat, use it also on deck furniture, shower tile, etc. The Best! Marine 31 Better than I expected! I was ready to have my pontoon seats redone or replaced I found marine 31 online purchased this product . I was totally amazed at how well it works. I had one seat to do when it started raining I continued working in the rain l just couldn't stop cause I was so excited and impressed with Marine 31! I am so impressed with this product that I feel I could sell this product and would like to try some of the rest of your products!5 star product! Marine31 really works!! Mildew literally just melted off after product application! Highly recommend! Unbelievable - Mildew Remover that Really Works! I�€™ve been hunting for a mildew remover that actually works for as long as I�€™ve owned boats. After forty-some years, I finally found one. 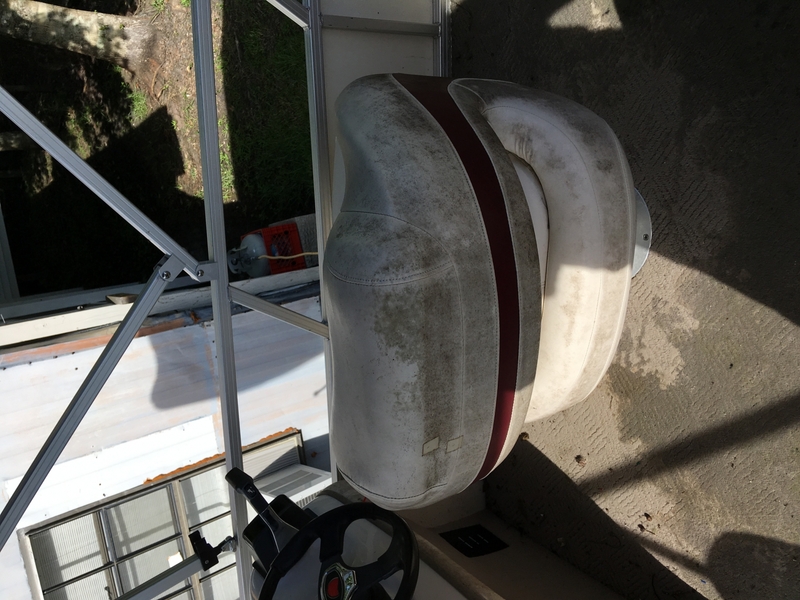 Marine 31 Mildew Remover is unbelievable; it works great! It removed some stuff in a couple of minutes that literally NOTHING else I tried would touch! Our pontoon boat stays in the water year round here in SW Florida, so the moisture (daily morning dew, fog, and lots of rain, plus the humidity) and heat make a perfect environment for mildew to grow. I've purchased many cleaning products over the years and most of the time I am disappointed in the results. 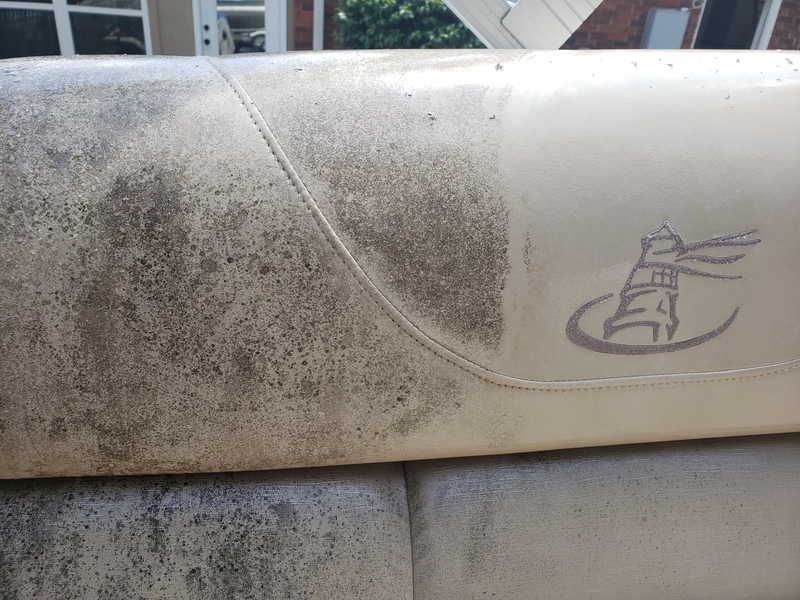 If you are a boater mildew is a constant problem. 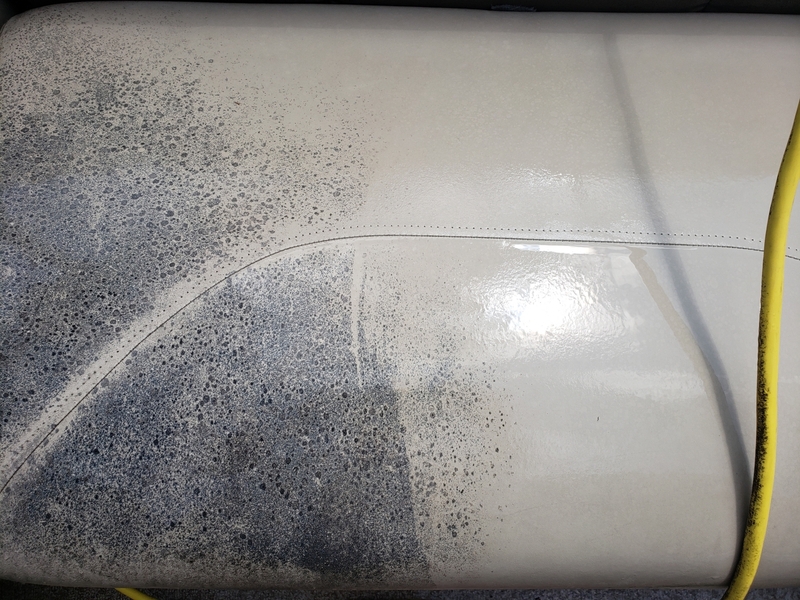 After a few months of neglect my boat had mildew stains on the vinyl seats and coaming bolsters. I used the Marine 31 for the first time and it worked. I was so happy with the results I ordered a gallon jug. It is a pleasure to find products that actually do what they claim to do. This is rare. Marine 31 has so many applications for us. Living in Florida mold is something we battle all the time. We have found that not only does it act as a remover but that it also has a preventative action. It takes longer for mold to grow back after it has been used on a surface. We highly recommend Marine 31 mildew remover.